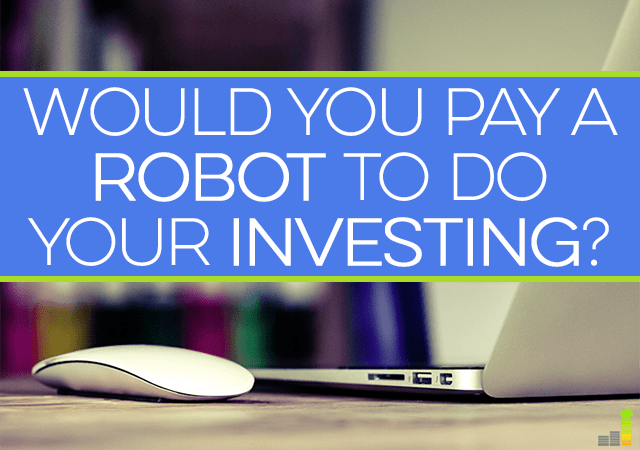 Would You Pay A Robot To Do Your Investing? Yes, you read that title right. I’m not talking about investing in robotics stocks, but having robots do your investing in the stock market for you. Truth be told, it’s not actually robots doing the investing for you. In reality, highly specified algorithms manage your money and remove the emotion from investing for you. I was reading this article on NPR recently that was talking about the growth in startups that are seeking to help make investing easier for the masses. I’m all for making investing in the stock market easier for those who don’t understand the basics as I saw great need for it in my former day job and thought this trend was something that warrants discussion to see if it’s something you should consider for your portfolio. What Do These Robots Do? You might think this is somewhat similar to Betterment as I have done a review of their services in the past. On one hand, it is very similar in that Betterment asks you questions to gauge where you “should” be invested and their algorithms put you in a basket of ETFs that match with that. One big difference between Betterment and SigFig is that Betterment houses your investments, while SigFig doesn’t – they move all your accounts to either TD Ameritrade, Fidelity, or Schwab. With all that said, the purpose behind these algorithms is to make investing in the stock market easier for those who lack the time or education to do so adequately. Investing in the stock market, on numerous levels can take time if you’re just starting out and have little knowledge. The argument that this investor should just open an account with Vanguard and go into index funds is a good one, but misses the point. The point is that many out there don’t even know what an index fund is, (trust me, I spoke with them every day for years) and are challenged to even know where to start on a basic level. With that in mind, I believe the offerings behind firms like SigFig are “good,” but do you want to trust an algorithm with your investment portfolio? Should This Be Considered a Viable Option? The main thrust behind this trend in using algorithms for investing purposes is a good one on several levels. The main one being lower cost, which many can benefit from when it comes to investing. At $10 per month you get rid of any trading costs, and the company would argue that we as retail investors get to benefit from that lower cost as it impacts the market (which honestly is a benefit). For the right investor, this could be a viable option to consider but is certainly not something that would fit everyone. My main concern is the seeming removal of the human element from investing. The article from NPR cited the desire to lower cost and the bias you can find with some financial advisors. I completely agree that some advisors are biased and sell based off of what’ll make them the most money and not you, but not all advisors out there are like that by any means. There are a large number of advisors who are good and can help you meet your goals, you just need to do your due diligence to find them. This is also not to mention the fact that these algorithms can easily be shut off, it just takes you to do it. 🙂 So, what happens when the Dow tanks 400 points and you’re tempted to sell off? You simply choose to flick the off valve on your algorithm and sell out. Sounds simple, doesn’t it? The problem is that decision could likely do more harm than good and is one that a good advisor (assuming you’re working with one) will help talk you out of by encouraging you to continue to maintain a long term view. As I look at it, this growth in using algorithm-based investing services for your investing needs has good and bad issues with it. I love that their intent is to make investing simpler for those who may not understand it. I also love that they’re aiding in lower costs and barriers to entry for the retail investor. That said, I don’t like that they’re aiming to replace, on several levels, the human element as well as advisors. In my opinion, both are needed in order to offer a full spectrum of investing options for all of us. Essentially, that is really what it all goes back to – there is no cookie cutter approach when it comes to investing. What is going to be right for me would be a mistake for you and vice versa. While there are a number of investing basics that most of us should follow, your investment plan really needs to be tweaked from there in order to take you to the destination you’re trying to reach. In regards to whether or not you should use an algorithm-based service to take a majority of the decision making out for you, that goes back to what your needs are as well as what your knowledge level is. Personally speaking, I don’t believe I’d ever turn everything over to something like that, though I’d not be opposed to putting a very small portion of my portfolio (say 5-10%) towards something like this to try out a strategy I’m interested in. At the end of the day though, please make sure that you’re understanding what you’re investing in as there are few things worse than investing in something you have no clue about. What are your thoughts? 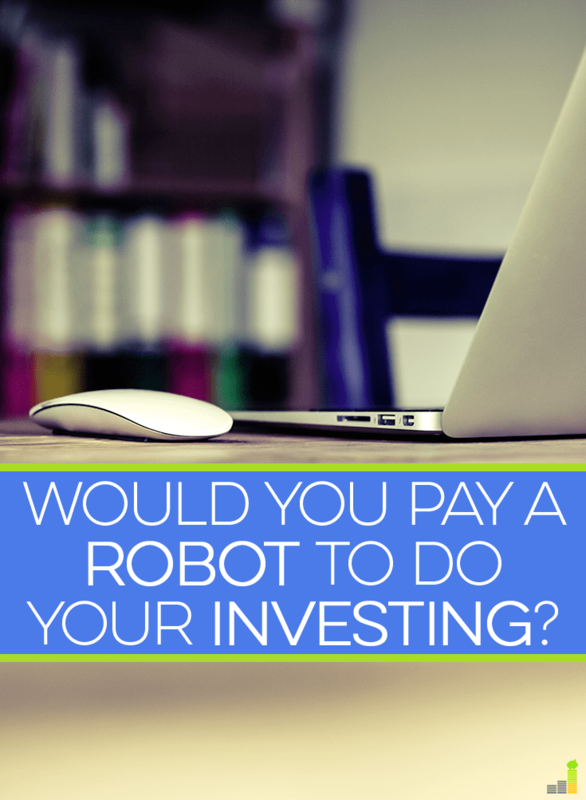 Would you trust an algorithm (or robot) to handle your investing in the stock market for you? Do you ever see yourself hiring a financial advisor at some point, or do you prefer to go it alone? I'm the founder of Frugal Rules, a Dad, husband and veteran of the financial services industry. I'm passionate about helping people learn from my mistakes so that they can enjoy the freedom that comes from living frugally. I’ve read articles before where universities and technology companies try to do something similar by picking the next greatest stock or potential growth spurts in the market. It usually ends in failure. Until they develop some sort of AI that can be used to make unique judgements about quality related factors as well as quantifiable factors, I would stick to a real person for my advice. I’ve read that as well MMD. I think something like this can work, though that unique judgement ability is what would hold me back from going all in with an algo based investment model. I actually use a robot for a good chunk of my investing.The way I look at it, I am simply buying on a regular basis, so if I can have a robot do the buying for me and automate the process, great for me. It’s less that I have to think about it and not have to remember to rebalance or the like. For most others, I think it is a good solution too. Since emotion is the main reason why people fail at investing, having a robot invest for you essentially takes emotion out of the game. With that said, I worked for an advisory firm and see the benefits they bring to the table. The problem is thought that most good advisors only deal with high net worth individuals. If you are the typical investor, you are going to have a tough time finding an advisor that isn’t pushing a certain product. I agree that if what you’re going to do is simple and straightforward, and you know what/why you’re picking then it does make sense on several levels. The cost savings alone are worth it. That said, I would have to go with MMD that what I don’t like about the algo based model is it lacks that unique decision making ability a person has. But, you have to go with what works for you and your situation. Honestly, I wouldn’t mind having an algorithm choose investments and investment allocation for me. I think human input is greatly flawed, though you could argue the human input INTO the algorithm could be flawed as well. Most people didn’t see the housing drop happen, and who knows if the algorithm would have been saying BUY BUY BUY real estate-related ETFs and whatnot. So I guess it is an improvement but perhaps not by much. At least it’s cheaper? I agree, that both are flawed and nothing is going to be perfect. I just wouldn’t go all in on an algo based model as you can lose out on a lot of factors, especially if it’s not trained to look out for certain things. That said, cheaper is good. I don’t think we would be very comfortable having either a robot or a financial advisor do our investing for us. We used to work with a financial advisor and it led to us having a ridiculously expensive universal life insurance policy, which we wasted a lot of money on before realizing it was a mistake. These days we work hard to educate ourselves about investments so we can make informed money decisions and do our own money management. That’s too bad Dee, I’m sorry to hear that. That’s exactly what I was talking about, that there are some advisors out there that will just put you into something so they can make loads of money off of you. That said, I am of the same opinion…I’d much rather see someone educate themselves as to what they’re doing so they can make informed decisions based off of what’s best for them. There were actually many times as a financial advisor that I thought robot investing might make sense since from my perspective, most of the “bad” investment decisions came from an emotional place, i.e. the Dow tanked 400 points, let’s sell, or Apple is going to keep going higher (when you should probably sell and take profits off the table). I agree, though, that it helps to have someone’s opinion and guidance, yet there are many financial advisors who are just as emotional as their clients. And typically the best long term investing strategy is to pick the right asset allocation and rebalance frequently. I have had clients who didn’t want to rebalance because it meant selling something that was going up and buying something that was going down. I had to remind them that “buying low and selling high” is the most basic fundamental of investing, hence the value of rebalancing. A robot would just do that for you. Those are some great points Shannon! I agree that there are many advisors that are going to be just as emotional as their client. Thus, why it pays, literally, to do your due diligence before selecting an advisor. If you lack the time and just want to follow that approach, then I’d agree that turning it over to an algo could work…as long as you didn’t trick you into thinking you don’t need to check into it on a regular basis. I wouldn’t mind having an algorithm choose either. I hate picking individual stocks and stick mainly to index funds. Sounds like it could work for you potentially. Anything that makes it easier for people to invest and lower fees is a good thing if you use it correctly. If you shut it down and sell during a down turn, you lose, on your own or with the robot. I would use a service like this and do use betterment. When you don’t put much in at a time, the fees really kill your returns, so I like the idea of no charge until you have a balance built up. I agree, that it can work if you use it correctly. My concern would be for people to simply ignore it since something else is doing it for them. Which, is also a problem in working with an advisor. Handing off management of your investing doesn’t mean giving up responsibility. I like the robot idea! We all know that none of us can ‘outsmart’ the market in the long run, and we know the huge role emotions play in investment decisions. Why not let an emotionless machine take over? That’s just the problem though Kurt…we have the ability to turn these algos off. Which, in my opinion, could very well turn into one of two things – either you as the investor ignoring your investments or turning off the algo due to emotion. This is something a well informed investor would be inclined not to do if they’re managing it on their own or have an advisor they can trust. Since I have investments in Betterment, I do invest with a Robot. I don’t think it is really an issue, but then again, I took the time to learn about investments and just like Betterment. I don’t have time to deal with my investments as much as I would like, but I like Betterment behind me. Since I get to keep my emotions out, I don’t have to worry about going all in on a bust stock! That’s the key Grayson, educating yourself. Far too many don’t do that and end up paying for it in the long run. I can also see how it would help out when you don’t have much time. You should really manage your own or at least most of it, because nobody knows how to handle your own money better than you. But, I wouldn’t mind having a portion of my portfolio being managed by algorithms. I wouldn’t put all my money there, but maybe a little “gambling” money. I’ll keep the biggest chunk of my portfolio on index funds and maybe play around with 5-10% with these investments. I’m basically that way as well Aldo. I can see hiring an advisor if you’re high net worth, or something like that. But, I’d much rather do it myself. I prefer to go it alone! I think that no one will care more about my finances than I will, so I don’t see the point in letting someone else do the job if I’ll do it better. Great point Natalie! Even the best advisors won’t care as much as you do, though I do think if you “need” one it can be helpful to have someone that is more objective than you about your money. I would have to say I prefer to go it alone. When I first started out, I had a financial advisor that was with the bank I was with. Although I got along great with her and she was helpful when I was a brand new investor, I found that I stayed with investments that were way too conservative for me at that age. I had kept on renewing my GICs for longer terms and had barely seen any returns on them. I think I just renewed them because I didn’t what else to do and she never mentioned about going more aggressive. I had to ask to put the money into index funds and then eventually growth funds. I find it pretty satisfying knowing that my net worth is slowly increasing and that I did most of the research on my own. That’s definitely a problem you can run into Karen. Glad to hear that you’ve been able to go it alone and make some good headway as well. I am a do-it my self investor. I like to pick individual stocks my self if I find value on them and am getting great returns for last 3 years. I don’t think I am very comfortable having either a robot or a financial advisor do our investing for us.